Occupation: A@P Mechanic, Lead Mechanic at Montgomery Aviation, Inc. 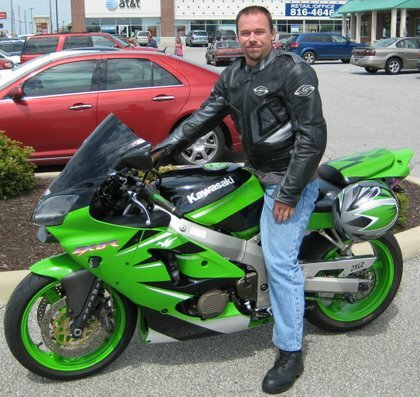 Favorite Ride: Last summer went and did the Tail of the Dragon, Cherohala Skyway and Blue Ridge Parkway. Miles and Miles of Curves! Interesting Facts: This Coast to Coast was practically on three cylinders. It all started as I was going thru Atlanta, GA heading for Jacksonville, FL that I ran out of gas at 158 miles. Which I usually get 180 miles before reserve. And that the bike was running sluggish. At a steady throttle setting the bike would lag then run and so on for miles. Assuming bad gas, or pinholes in vacuum slides, or just that it was 113 degrees I new something was up. I said to myself once I’m in Jacksonville I would take apart the carbs to see if I could repair the vacuum slides and change spark plugs. But once I found a hotel close to the beach I did not work on the bike since it was a super nice clean hotel. But starting out the bike was running fine but the gas mileage was not where it was supposed to be. So right before I crossed into Texas I bought a gallon fuel can and strapped it to my luggage. I think I used it only twice when I pushed a little further. I had planned on eight or nine stops but ended up doing fifteen fuel stops. Made it too San Diego, CA in 43 hours and 48 minutes. But on my way home in New Mexico the bike had no power at all. So I changed spark plugs (used) at a truck stop parking lot. Still no power. I was trying to make it too Albuquerque, NM but only made it too Grants, NM. I found a auto parts store and bought brand new spark plugs. I noticed that #1 plug was not being used like it was not firing. So I assumed it was a coil. I checked the vacuum slides by pushing them in and listening for air, everything seemed good. So I found a motel to start calling dealerships, no coil to be found. Plus it was after closing for most places. I camped out in Grants, NM for two more days waiting on a coil to arrive thru mail order. Expedited means 3-5 working days, after the third my girlfriend and I tried other resources. Still nothing except she wanted me to get a part number off the coil. Not looking forward to take apart my bike again I went too work. I tried my vacuum slides again and was not gentle with them this time. Rattle, rattle… I heard something loose inside the slide. I took the carb top off and noticed loose parts and nothing holding the needle down. The needle holder and spring were just bouncing around inside the slide and nothing holding the needle down. So I put it back together and took off on a test drive. Hooray it was fixed, and could have been fixed earlier if I troubleshot better. So journey continues with a kinked chain even though I was lubing the chain every stop. Gas mileage was back to normal and everything was running good just having the worn chain in back of my head worried me. After nine days on the road 5,408 miles later I made it home. Wanting to do it again with the much improved gas mileage. Just to see what my time would have been then. Maybe some other time.